The UK building sector and heating in particular has been identified as having the greatest potential for significantly reducing emissions to meet the nation’s stringent reduction target by 2050. And with a staggering 80% of the total lifetime costs of a commercial building spent on its operation and maintenance there are added economic incentives for improving building efficiency. One means of achieving this is to digitalise heat, using new technology to create a more efficient way of working. Which is where building information modelling (BIM) comes in. Of course, for many in the industry, BIM is not a new concept. Following the UK Government’s BIM Level 2 mandate on all centrallyprocured projects by 2016, 74% of consultants, contractors and building operators now work in BIM. The integration of BIM is becoming a normal part of the building construction and, increasingly, the building operation process, with the figure expected to rise to 90% in the next three to five years. So what is BIM and how can it help improve building efficiency? BIM is a collaborative process that uses a shared, up-to-date system of digital 3D models to design, construct, operate and maintain a building. In so doing, it can enhance efficiencies for significant time and cost savings and higher quality design. According to PwC, use of BIM Level 2 could save the government £400m a year on its capital building programme. While BIM provides up to 5% benefits at the design stage, the real benefits are in the maintenance and operation of the equipment and its eventual replacement. Clash detection is frequently identified as offering the greatest single benefit as the 3D BIM models enable consultants and contractors to create virtual plantrooms. On heating refurbishment or plant replacement projects, this early visualisation supports ‘right first time’ success, enabling issues to be identified and addressed at the outset for time and labour savings. In this way, BIM can help flag space constraints such as restricted access into the plantroom or limited maintenance or clearance access. Using BIM also enables pipework runs, flues and pumps to be sized more accurately, quickly and efficiently. The BIM process helps improve and enhance information for improved asset maintenance. With a digital BIM record of the building, it is easier for building operators and facilities managers (FMs) to group, access and manage information on the assets during the operational phase. When it comes to heating, this helps optimise equipment performance and reduce unnecessary waste, saving time and costs. BIM models provide robust data that can help FMs and building operators create preventative maintenance schedules more easily, if these are not already automated. If they are, BIM can connect to the software to supplement the existing information, helping avoid failures and costly emergency repairs to the heating system. In this way, BIM helps with proactive replacement of plant that has come to the end of its serviceable life, keeping heating efficiencies high. When it comes to maintenance and servicing, the 3D environment of BIM makes it easier for heating engineers to visualise the heating equipment and its location. Sharing the BIM file, complete with a full service history, with the engineer ahead of a service visit could save significant time and costs, improving time management and accuracy. 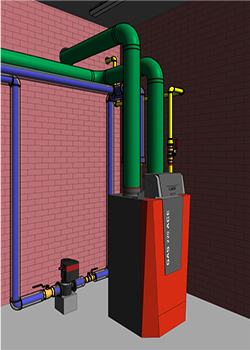 Working in a BIM environment FEATURE WORKING BUILDINGS Working in BIM provides significant benefits in the maintenance and operation of heating equipment and its eventual replacement (image courtesy of Crofton Design) also helps to identify where space could be used more efficiently. This is useful when relocating the plantroom or altering the footprint of the heating plant to gain valuable extra space, while supporting more efficient future alteration or change of use. At the same time, the level of data in BIM models assists in supply chain collaboration and with the procurement process or costing decisions, which again results in time and cost savings. Manufacturers like Remeha provide BIM files with differing levels of details (LOD), designed in a standardised format using the CIBSE product data template (PDT). A LOD 5 BIM object of a boiler will include information on its service and maintenance areas and maintenance schedules in addition to its shape, size and weight, the heat outputs, and its carbon and NOx emissions. FMs can then import this data into their facilities management systems. Moving the position of the boiler or changing the model will automatically update the schedule so that the information is always accurate and up-to-date. If changes were to be made to the design or requirements of the heating system, schedules and quantities would be generated automatically. BIM is not just about digitising data – it also supports the adoption of new technologies and techniques that could achieve higher heating efficiencies and/or more efficient installation. BIM requires early planning and access to consistent, reliable, regularly updated data. 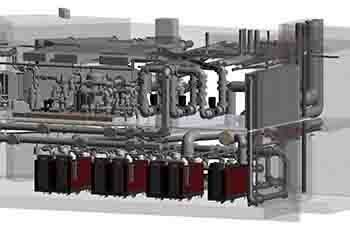 This makes it easier to make more widespread techniques like off-site manufactured bespokedesigned rig systems for multiple boiler installations, as these also require front-loaded design. The advantage of using off-site fabricated solutions is reduced on-site labour and costs on refurbishment projects and improved site safety and quality control. The era of digital engineering is approaching. Fittingly, BIM is also evolving from Level 2 to its next iteration, Digital Built Britain (DBB). This is predicted to focus more on built assets in operation and how they interact with people, helping us to heat buildings even more efficiently. Fortunately, good manufacturers like Remeha already provide free 3D BIM models on their heating equipment, with the appropriate level of high quality information to meet project requirements, smoothing the digitalisation process. The operational savings that the BIM process can achieve across a building’s lifecycle are clear. And crucially, by creating a digital record of a building, BIM is central to creating the ‘golden thread’ of information called for by the Hackitt report. Through BIM, we can ensure that our buildings are not just more efficient through their lifetime, but safer places to be.